Get the best out of your Apple gadgets with PNY’s specially designed range of Apple accessories for your iPhone, iPad and iPod device. 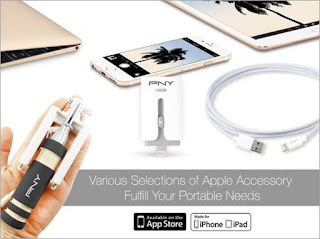 PNY has released a selected range of gadgets dedicated to Apple products that complements and maximizes the performance of your favourite iPhone or iPad. The apple-centric products include the DUO-LINK M, Selfie stick SF2 and 6ft Apple Lightning charge cable.Running out of memory space and need more room for storing your favourite clicks and wide music collection? PNY’s DUO-LINK M is the perfect solution to store all your personal selection of music, videos and images in your lightning equipped iPhone or iPad. Expand your phone’s limited storage capacity with the DUO-LINK’s massive 128GB memory. Now you can transfer pictures and songs to your PC or MacBook without deleting them by simply plugging in the DUO-LINK M and freeing up your phone’s memory space. The DUO-LINK M is not only limited to storing and transferring files, but you can also stream movies or music to your lightning equipped iPad or iPhone without a wireless network. Light and compact, the DUO-LINK M is an extremely convenient digital storehouse that features a standard USB interface and a lightning connector. PNY has released the DUO-LINK App for users to download and use the device at its full potential. The user manual can be downloaded from the App store and your device is ready to be used. iPhones have one of the best cameras for capturing selfies and snapshots of your favourite moments. You can enhance the fun and creative part of it with PNY’s Selfie Stick SF2. This Aux-wired monopod extends from 13.5 cm to 60 cm, so you can capture wider shots for group selfies or to shoot landmarks. Clicking selfies or transferring files from your phone can seriously drain your iPhone’s battery life. Keep them fully charged with PNY’s 6ft Apple Lightning charge cable. The 6ft cable allows you to easily connect to your Apple iPhone, iPad or iPod to charge the battery or sync with your media library. Normal charge cables limit your phone’s charging capacity due to its short cord length, but PNY’s 6ft cable prevents this problem by allowing you to reach your wall charger or the USB port located on the front/back of most computers. No more tangles or messy cables thanks to its flexible cord and ultra-light weight size. The 6ft lightning charge cable works with iPhones, iPads and iPods.